Legend says that Easter eggs began with the Chinese, who gave them as gifts to celebrate spring. Here’s our baker’s dozen. Bravo to the chefs, salut les artistes! 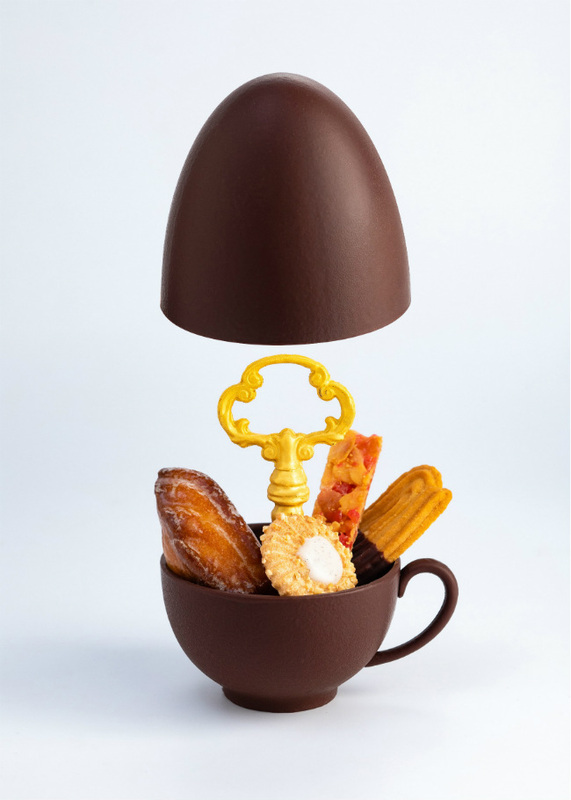 François Perret’s L’œuf Five O’clock reminds me of Lewis Carroll, but Perret tells me proudly, “I’ve reproduced an edible version of the porcelain tea-cups used in Salon Proust every afternoon.” Chocolate Venezuela Carupano 70% Limited Edition. Priced at €85. Order from 6-21 April 2019, and collect from the Ritz Concept Store. 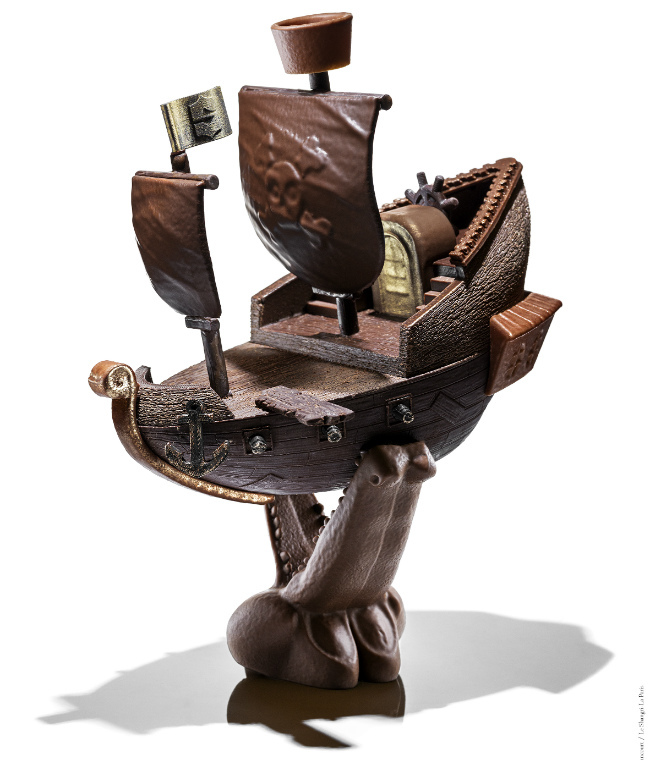 This sculptural collection includes an exciting chocolate praline bonbonnière – filled with choco-fishes – inspired by the globe trotting adventures of Monsieur Ducasse – ideal for the traveling chocoholic with its bespoke shockproof case. 500g – 65 € in dark or milk chocolate. 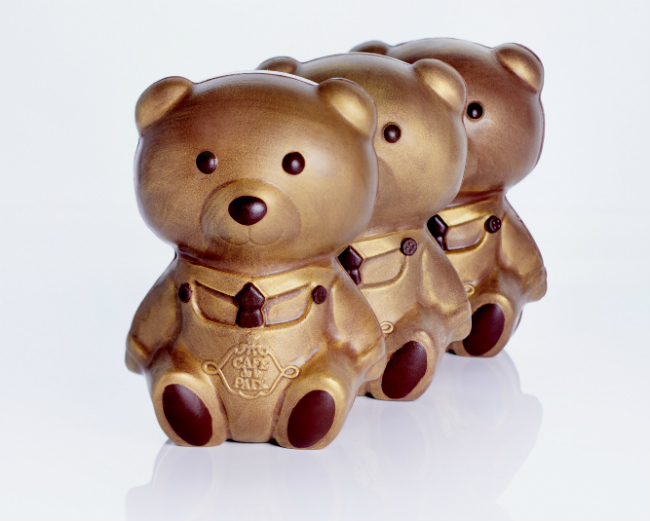 Available from all Ducasse Chocolate boutiques, outlets (Gare du Nord) and the e-boutique. “An egg’s not just for Easter,” insists the quirky MOF chocolate artist known as “the Rodin of chocolate.” So, do pass by the boutiques (or order online) and discover the amazing world of Patrick Roger and the stop-you-in-your-tracks window displays of giant chocolate sculptures, as well as the fragrant aromas. 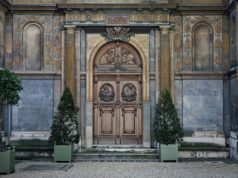 Using milk chocolate from Brazil (Riachuelo 51%), Sophie de Bernardi, head pastry cheffe at Café de la Paix and Intercontinental Paris Le Grand, pays homage to Alfred the house mascot – named for Alfred Armand, architect of The Grand Hotel (built circa 1862). Available from 15-28th April, 2019, priced at €35. This celebrity chef is a French “national treasure”– watch him in action on M6 Les Rois du Gâteau (Kings of Cake). 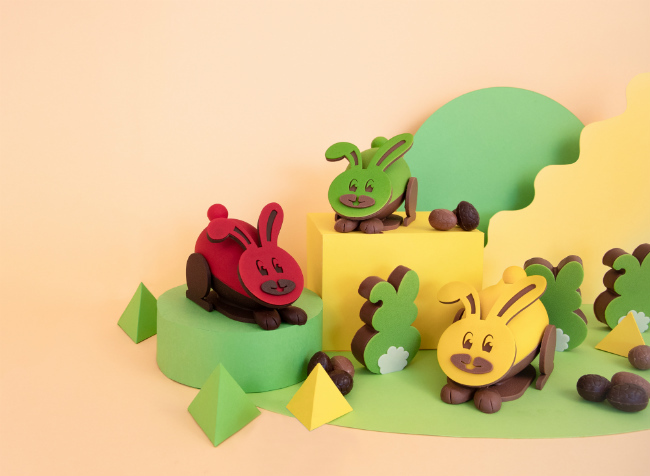 For Easter 2019, the duo Lignac / Benoit Couvrand present “Rabbits Hop Hop Hop” (€26) and Marshmallow vanilla milk chocolate Rabbits (Lapins Guimauve) (€7.50). 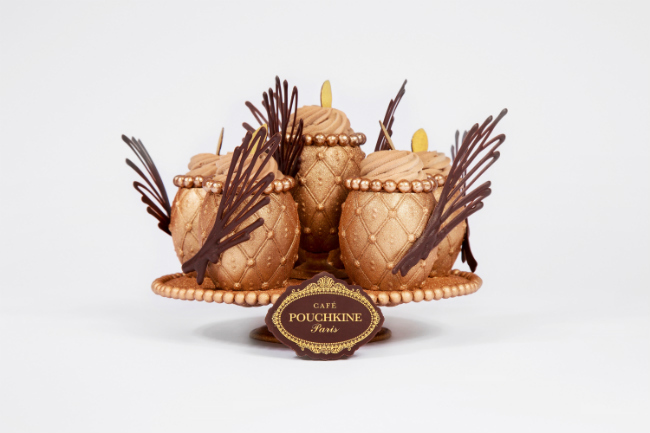 And it’s difficult to resist the sensual brushed traditional egg filled with pralines and fish (€35) or the creamy, dreamy, limited edition Le Saint-Honoré – to serve 6 (€43). 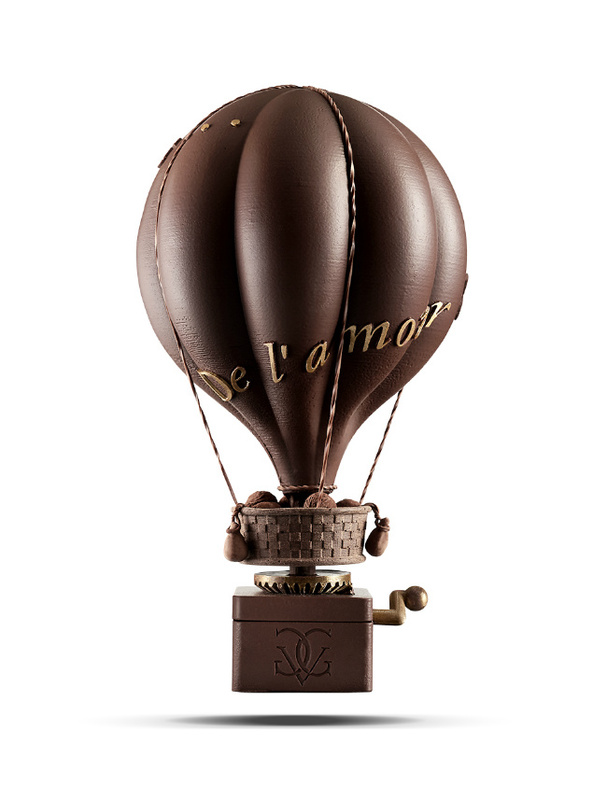 His awesome work of art (€75) bearing the logo “De l’Amour et du Chocolat” (Love and Chocolate) has a working chocolate handle, made with Madagascar and Brazilian beans 75% exclusive to Four Seasons Hôtel George V. Taste everything (including the €35 choco-cloud) in the pop-up Easter boutique from 13-22 April, 9h-20h. 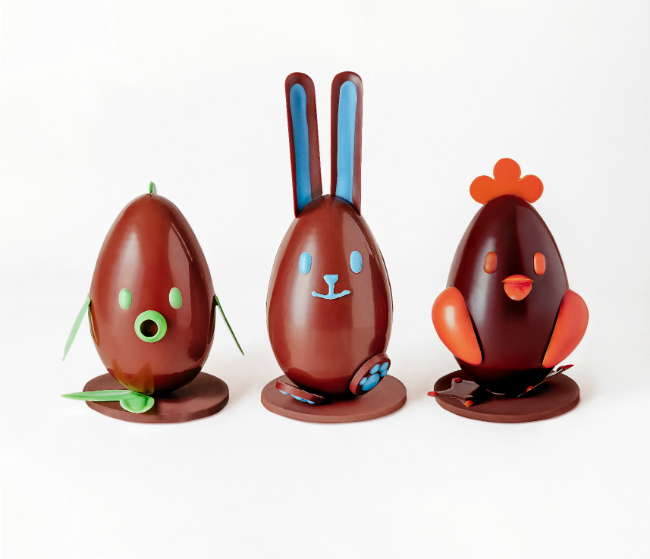 Visit the boutique/tea room where Luc and Léa, the marvelous millenial chocolate makers, present their eclectic 100% pure collection including these fabulous figurines – fish – rabbit – chicken (€29.95 each). 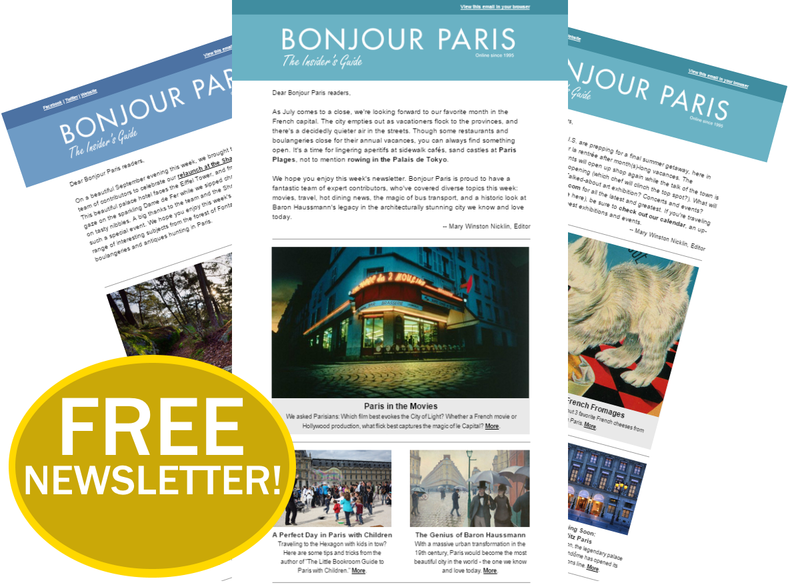 Also available from La Grand Epicerie, Paris, Rive Gauche & Rive Droite from 28 March-1 May and via Chronofresh. 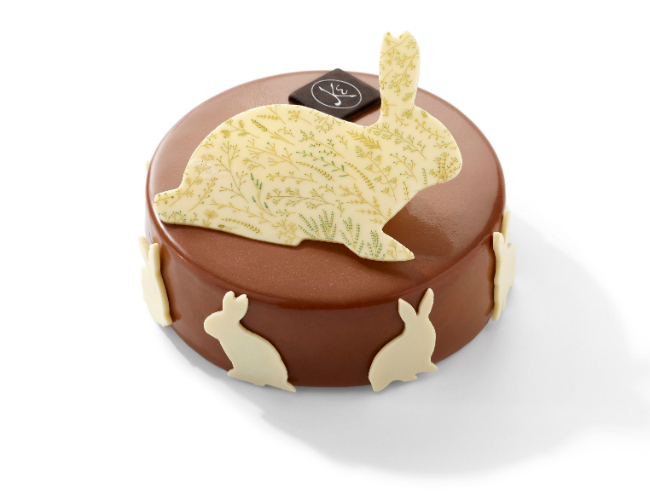 The 6th generation baker (born in the Lorraine region) takes inspiration from “Lapinou” the Easter hare who – tradition says – delivers eggs to the children of eastern France, and also symbolizes spring, renewal and fertility. Cocoa biscuit, crunchy feuillantine, praline, milk chocolate, cut with kalamansi (small exotic citrus fruit). Add light coffee frosting and leaping white chocolate, “lapinous” in silhouette – 4 people (€25), 6 people (€35). And, because brand Kayser’s all about the bread, “Pain Ekmek” studded with dark 54% chocolate, hazelnuts and tonka beans is seasonally available until the end of April (€4). From Russia with Love! Chocolate temptations by executive pastry chef Patrick Pailler. 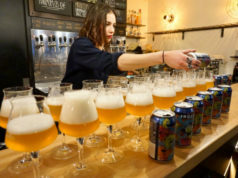 Until 29 April 2019 at Pouchkine boutique/café and also Printemps, 64 Boulevard Haussmann. 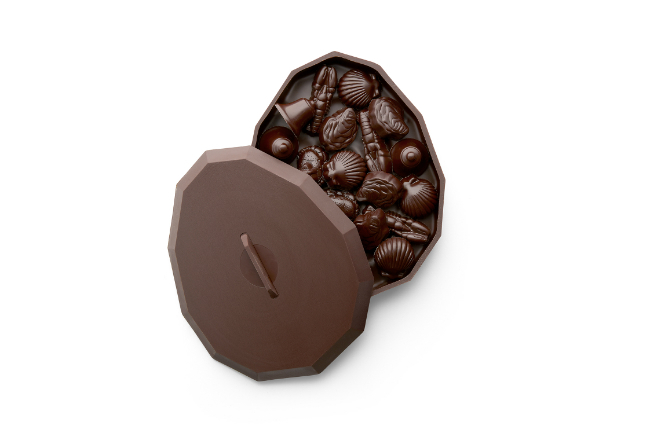 The delicate “quilted” eggs are available in grand cru dark chocolate (67% cocoa, notes of hazelnuts and tonka beans) or milk chocolate (40% cocoa, vanilla notes). Inside, nougatine, caramel ganache and hazelnut praline mini eggs. 260 grams. Priced at €32. 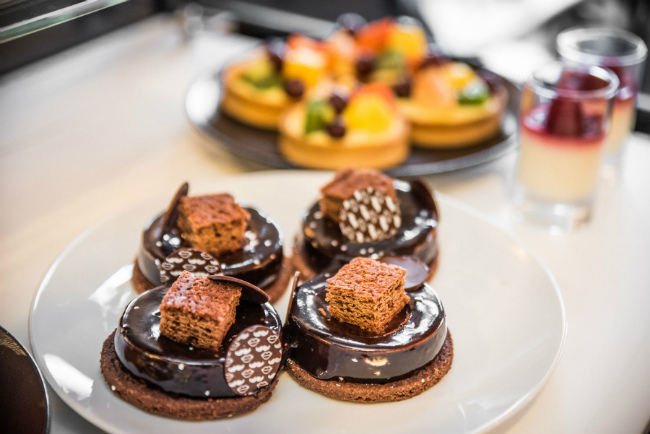 On the bucolic rooftop terrace, overlooking le tout Paris, enjoy pre-Easter 100% chocolate tea-time featuring Petit Carreaux de Paris chocolate. No reservations. Taking place the 7th, 14th and 21st April, 2019. 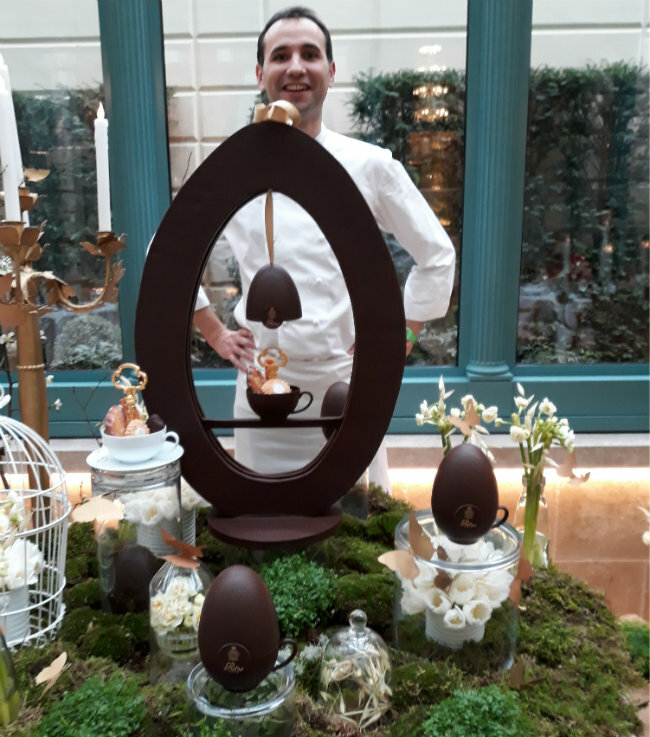 However, you can reserve “Le Brunch Festif” on Easter Monday 21st April, which promises chocomania as in chocolate fondue/easter egg hunt/and “Terrass Kids Club” surprise entertainment. €45 + €10 per child. 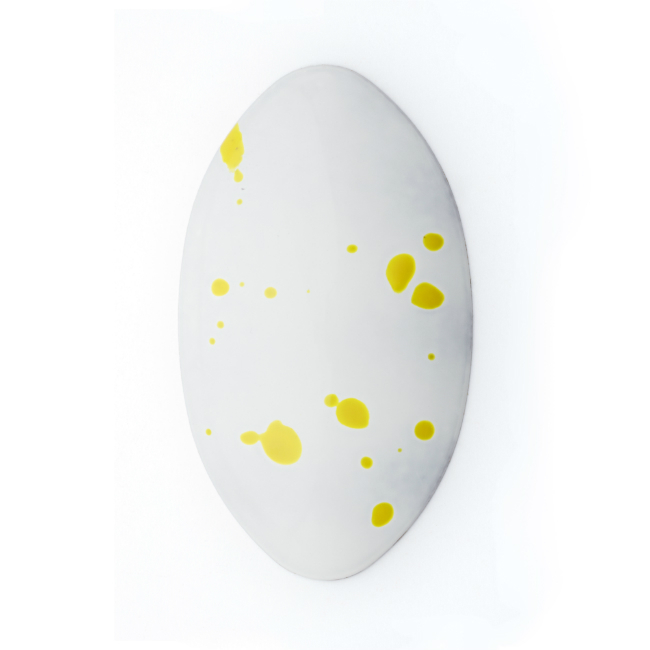 When the “Picasso of pâtisserie” discovered the iconic Christofle MOOD elliptic shaped cutlery holder, he thought it resembled an Easter egg and decided to chocolatize it! 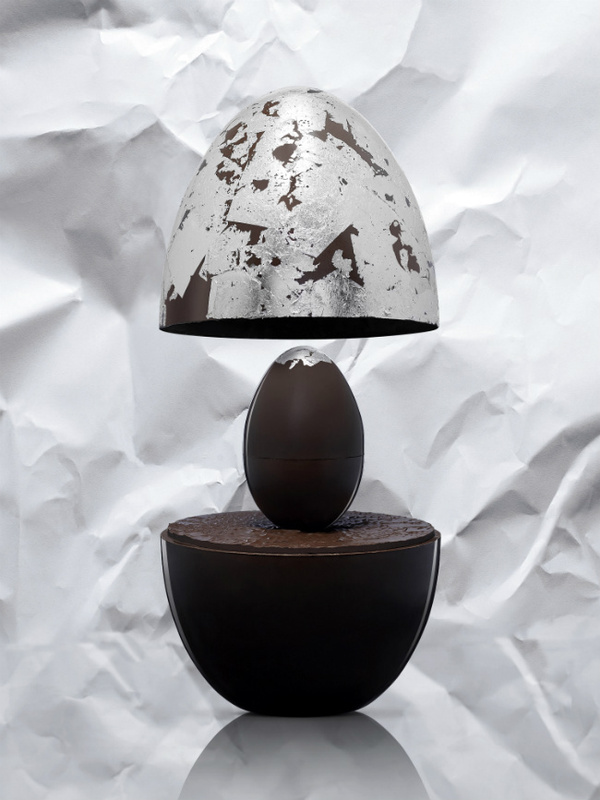 Using pure Belize Origin, Cayo District, Xibun Plantation 64% Cocoa, Hermé interprets the exquisite table setting piece in two versions: silver for Maison Christofle and chocolate for Maison Pierre Hermé Paris.